TRANSPORT YOURSELF TO YOUR FAVORITE VINTAGE ITALIAN CAFÉ OR BISTRO. Ideal illumination for entertaining in your backyard, terrace, gazebo, patio, or contemporary cabana. Recreate this feeling every evening or highlight a special occasion. Professional planners request this outdoor lighting for anniversaries, weddings, holiday celebrations, and many other occasions. COMMERCIAL QUALITY AT A RESIDENTIAL PRICE. 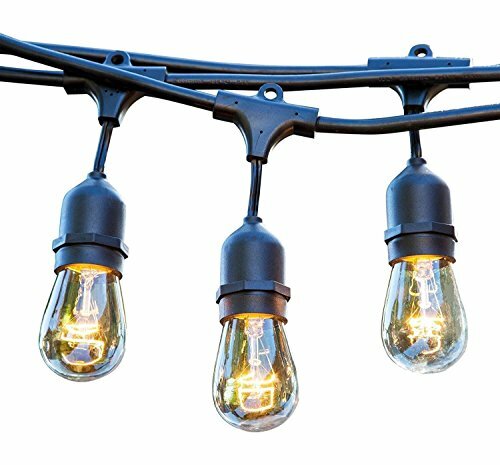 Our 48 foot black weatherproof cord contains 14 gauge wire strung through 15 WEATHERPROOF light sockets, set 3 feet apart and is designed to work on 110/120 volt (US). Heavy duty rubber construction throughout the molded sockets & integrated hanging loops. Compare to other hanging lights and see the difference in quality and service! DIMMER COMPATIBLE. Our 11 Watt Incandescent bulbs are compatible with any plug-in dimmer or dimmer switch to enhance the atmosphere of a romantic evening, an elegant night time celebration, or a wedding reception on your patio, pergola, gazebo, or in your backyard for year-round enjoyment. Our bulbs are guaranteed to last 6000 hours. If you are looking for 48 ft string lights with LED bulbs, then please search ASIN B01NCEOQDU. It is the same heavy-duty strand with more energy efficient bulbs. SIMPLE INSTALLATION. Use cup hooks, guide wires, or zip ties with the built-in loops to hang perfectly. Connect up to 9 strings to brighten any event and create a festive flair. Enjoy years of illumination at any venue indoors or outdoors with just a few minutes of installation. FREE design idea guide and installation tips and suggestions with purchase! WORRY FREE PURCHASE. At Proxy Lighting we stand behind our products with an Unconditional LIFETIME Satisfaction Guarantee. If you are not 100% satisfied for any reason, please CONTACT US immediately and we will do whatever it takes to make it right. If you have any questions about this product by Proxy Lighting, contact us by completing and submitting the form below. If you are looking for a specif part number, please include it with your message.